Just one day after it formed, the southern Atlantic Ocean the now former sub-tropical storm 90Q appeared to be fizzling out on NASA satellite imagery. Infrared imagery from NASA's Aqua satellite showed little convection associated with the storm on March 12. Sub-tropical and tropical storms are rare in the Southern Atlantic, and this one marks the third since 2004. On March 11, the Brazilian Navy Hydrographic Centre (BNHC) reported that a sub-tropical storm had formed near east of the Brazilian state of Rio Grande do Sul, the southeastern most state in Brazil. When NASA's Aqua satellite passed over 90Q on March 12 the Atmospheric Infrared Sounder or AIRS instrument that flies aboard captured infrared data on the rare storm. Infrared data provides temperature information on several factors associated with tropical cyclones (among other things), such as cloud tops and sea surface temperatures. In an AIRS infrared image on March 12 at 4:11 UTC (12:11 a.m. EDT) cold cloud top temperatures (which indicate high cloud tops and strong thunderstorms in a tropical cyclone) were only evident near the storm's center of circulation. There were fragmented bands of thunderstorms east of the circulation. AIRS data showed that the sea surface temperatures off the Brazilian coast were warm enough (at least 80F/26.6C) to support the sub-tropical cyclone. At 1200 UTC (8 a.m. EDT) on March 13, the BNHC was no longer referring to 90Q as a sub-tropical storm. By that time, the remnants of 90Q had moved east and was located near 34 degrees south latitude and 38 west longitude. 90Q's minimum central pressure was estimated near 1004 millibars. Two other sub-tropical cyclones formed in the Southern Atlantic since 2004. 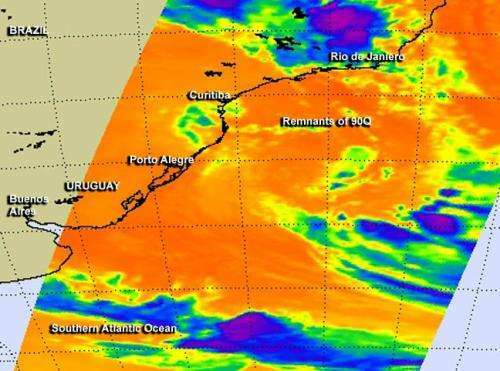 The most recent occurred on March 10, 2010, when Tropical Storm 90Q (the name was re-used this year because the storm was not retired) formed about 180 miles east of Porto Alegre, Brazil. Before the 2010 storm, a hurricane called "Catarina" made landfall on March 28, 2004 near the town of Torres in the southern Brazilian state of Santa Catarina.